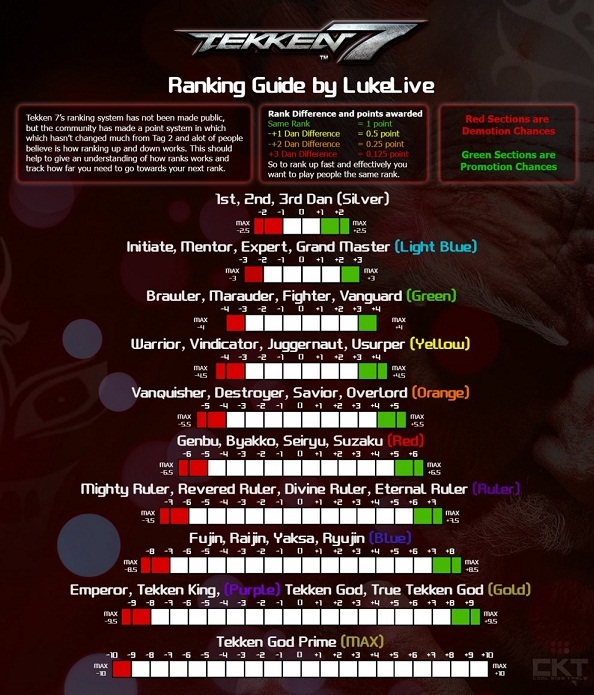 In Tekken 7, the ranking system is primarily there to connect you to other players who have the same fighting skills. In the game, if you won a rank and change the character, you have to fight again. The ranking system applies only to a Tekken fighter. If you want to try another, you have to beat up again to the top. You cannot level quickly if you fight against stronger players. This is to prevent some fighters from exploiting. The ranking system in Tekken 7 attacks in Arcade mode, the Treasure fight as well as the online modes. If you play against an AI and thus in Arcade or Treasure mode, there is a separate rank system, which also belongs together. So, get the rank you get in the Treasure Battle, also in Arcade mode and vice versa. This is different in online battles. Here, there is a separate rank system, which is delimited by the other two modes. In Tekken, there have been a lot of ranks for quite some time, which you can ascend or descend. The names originally come from the martial arts and therefore also have Japanese terms. The colors in the ranks of Tekken 7 will show you how strong or weak a fighter is. They are arranged as follows (from beginner to pro): silver, light blue, green, yellow, orange, red, violet 1 (Ruler-classes), blue, Violet 2 and Gold. The following list shows you all the ranks you can reach in Tekken 7. However, it begins with 1st dan. But there are still ranks in front of it. So start with Beginner and then work your way through Kyu. In contrast to Dan, Kyu starts with 9. You then work up to 1 Kyu. The ranks are not only important for matchmaking, but also if you want to unlock all the achievements of Tekken 7. The following graphic of shows the system, after which you ascend or descend. The red zones define the areas where you will be moved down a rank while you are able to move in the green zone. Once you land in rank 1, you need one or two points to land in 2nd dan. You gain a point when you face an opponent with the same rank as you. If you have a difference in rank, you only get a half point. This means that you cannot level if you fight a stronger opponent.